And Georgia Secretary of State Brian Kemp deals the cards. Kemp, whose job it is in Georgia to regulate statewide elections, has been using all sorts of tricks to keep, last time I checked, 30,000 people from voting in this year's gubernatorial election - all because a few names on the rolls are spelled wrong by a letter or two. 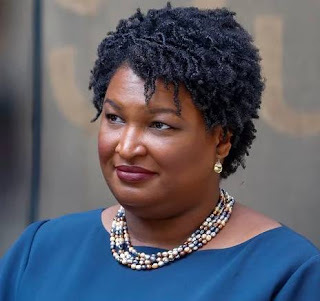 Kemp, a Republican, is apparently afraid that there will be too many Democrats going to to the polls and voting for Democratic gubernatorial candidate Stacy Abrams, pictured below. Now why would Brian Kemp be scared of a nice lady like this being elected governor of Georgia? It's not because her name sounds Jewish, is it? Oh, mercy me, where is my head? It's because she's black - like 70 percent of the registered voters Kemp has purged from the rolls. He's also dong this to strengthen the hand of the Republican gubernatorial candidate, who happens to be . . . Brian Kemp! Abrams is promoting an agenda to make Georgia a fair, just state (note that I didn't say see was promoting and an agenda to make it "more" fair and just), and Kemp clearly believes that the worst thing Georgia could have is a black woman running the show. I can think of something far worse - letting Brian Kemp run the show. He makes Trump look civilized, what with his own anti-poor, anti-immigrant agenda. He's promised to go out through Georgia and apprehend and deport illegal immigrants himself with his own pickup truck. I must say, it took the Democrats guts to nominate a black woman for the highest office in the Peach State, but it may be paying off; early voting in Georgia has tripled over the number of voters in 2014. Polls give Abrams a slight edge, although Nate Silver's FiveThirtyEight.com site rates the race as a toss-up. After having tried and failed with running Jimmy Carter's grandson Jason for governor in 2014 and running Sam Nunn's daughter Michelle for the U.S. Senate that same year, Georgia Democrats are eschewing dynasty politics and trying something different, which may enable them to do something they haven't done in a long time - win an election. (And also bear in mind that Jon Ossoff is Not. Running. For Anything. Again.) But as long as Brian Kemp is calling the shots over how elections are run in Georgia, Abrams' election is anything but a guarantee. UPDATE: That 30,000-person figure of people planning to vote has now been revised to 53,000 people - specifically referring to those registering. The majority of these 53,000 people - rejected for inexact name spellings, as noted in the post - are black.